Here is the information about one of the most incredible museums in the world dedicated to a human body - Mutter Museum. Learn about its location. Mutter Museum is not for the faint of heart. Various people may have a hard time dealing with the contents of this museum. 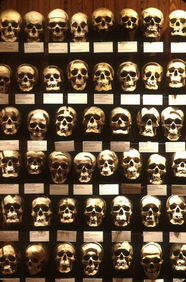 One of the most unusual attractions, the Mutter Museum has got to rank among the most unusual places in the world. Founded by Thomas Dent Mütter in 1856, the Museum was intended to display medical rarities. Nowadays its collections contain some 20,000 human specimens and medical instruments from the 19th century to the present. Visitors are greeted by the Hyrtal Skull Collection: 139 human skulls arranged in a cabinet. All skulls are labeled as to where it came from and what happened to its previous owner, and they depict physical variations among ethnic groups of Central and Eastern Europe. The famous Siamese Twins, Chang and Eng Bunker that died in 1874, after marrying and fathering 21 children between them. At the Museum you may see their connected livers, a plaster cast of their torsos, and a chair built to accommodate the twins. There is also the largest human skeleton on display -- the bones of a 7-foot-6 giant from Kentucky. The display called Eye Wall of Shame is wax models of assorted eye injuries, such as a burned eye, an eye with a toothpick protruding from the retina, and other maladies seldom seen. The rest wax models (and if you were not told they were wax you would not suspect it) feature a variety of lesions, diseases, hydrocephalic heads, and other rare pathologies. You may also see an exhumed body of an obese woman whose fat condensed down into soap, and a few other bodies that are opened up for inside viewing. The body is quite old, the organs are dried out. Bear in mind, these are not wax models, these are the real thing. The majority of the exhibits are, and this fact certainly adds to the excitement of a visit. And the most unsettling exhibits are the remains of an unfortunate fellow whose skeleton began to develop outside his body and the grossly enlarged human colon - 27 feet long and 8 feet in circumference. And of course there are the many medical instruments which would seem more at home in a dungeon than a doctor's office. The Museum is a fascinating study in things that can go wrong with a human body. A tour is an education that will not soon be forgotten! Though there is no gift shop, a unique calendar can be purchased. The price of admission also includes the College Gallery, which features changing exhibitions, such as the startling Ancient Scorge, Modern Menace: Emerging Infectious Diseases. Closed - Thanksgiving Day, December 25th, and January 1st.